Home » Learn » End of Life and Grief » What Happens as the Body Dies? 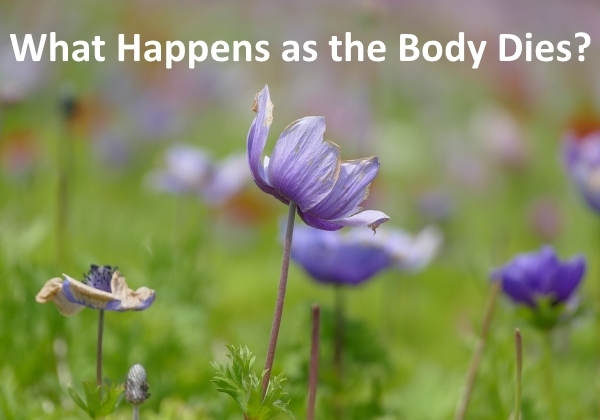 What Happens as the Body Dies? Our body is amazing. It has a system for fighting disease. It even has a system for dying. Though every person’s death is unique, there are similarities that occur in the dying process that are kind and help us have a good death. The closer we get to death the less we want to eat or drink. As the body dehydrates, there is less fluid in the lungs and heart to cause congestion. Because of less food and water, there is less pressure around tumors, so any pain may decrease. Dehydration leads to an electrolyte imbalance that causes a release of chemicals that make us sleepy and peaceful. People with end-stage Alzheimer’s may have some of these changes earlier. For example, they may start having difficulty swallowing months before they die, resulting in recurrent pneumonias, from aspirating food into their lungs. If kept comfortable, pneumonia can be a kind way to go. There are other signs that we can see months to weeks before someone dies. Patients start to lose interest in daily activities, as they begin the process of detaching from this world. Some patients start seeing people in the room. Some see deceased relatives, some angels or Jesus. Three weeks before he died, my father started seeing a man who stood at his left shoulder. He had whispered conversations with this invisible man, cupping his hand to keep us from hearing his words. He would chuckle and nod his head. As the body begins to actively die, there are physical signs. Blood pressure decreases while the pulse increases. The patient’s temperature can swing from feverish hot to very cold. His hands and feet may become very cold because the heart can’t circulate blood normally. A red rash may develop on the chest over the heart and across the back over the kidneys as blood gathers to help the major organs. A dark blue coloring appears on the fingertips, toes and around the mouth. My father slept with his mouth and eyes slightly open. He had the rash on his joints, chest and back, and his feet and hands were cold. I didn’t realize he had a fever until I saw that his pillow was soaked. I put a cool cloth on his forehead and used a toothette, a mint-flavored sponge on a stick, to keep his mouth and tongue moist. His breathing was shallow and more rapid as his body was focusing on the work of dying. Some people have one last surge of energy and call out to someone. Even people with dementia may become lucid for a moment or two and speak very clearly for the first time in years. Others search the room as if they are looking for someone in a crowd. When they finally see them—often in an upper corner of the room—they take one last breath and go. I wasn’t in the room when my father’s “breath became air,” to quote author Paul Kalanithi. 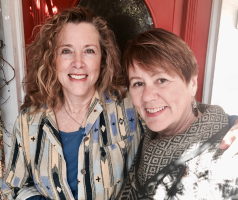 I was with my writing partner––hospice social worker Katie Ortlip. Nurse Katie Ortlip and author Jahnna Beecham (yaw-nah) began as friends and neighbors. However, when Jahnna’s 90-year-old father was told his prostate cancer had spread to his bones, Jahnna became his caregiver while Katie became his hospice social worker. Together, during this emotional time, they became even closer and shared insights on end-of-life care as well as how to have the best death possible, and their joint writing journey began. 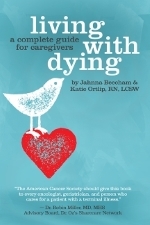 Their new book: Living With Dying: A Complete Guide for Caregivers is a comprehensive field guide for those caring for a loved one at the end of life. You can learn more and purchase it through the Together in This Amazon store. Click Here.